A surcee is a Southern word meaning "a little something extra or a happy gift". Here at Southern Proper Monograms, it means exactly that. With your order of $50 or more, add this to your cart and we will send you a Southern Surcee for free! Add items totaling $50 or more to your cart. If there is an active coupon and you plan to use it, make sure your order total will be $50 after the discount. Your order total is BEFORE shipping is applied. Add the Southern Surcee that applies to your order amount to your cart. We will send it along with your order! If your order doesn't total the amount needed, we can't send your surcee! Also, only one surcee can be added to each order. We cannot change or substitute free item choices. Quantities are limited. While supplies last. Our 8-inch three-letter monograms are cut from 1/4 birch wood and perfect for interior doors and appliques on furniture. Each of our monograms are cut from UNFINISHED WOOD, ready for paint, glitter or whatever you can imagine. 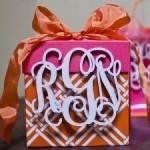 We recommend spray-painting your monograms with several thin coats in the color of your choice. The size of this monogram is the height of the center letter. The width will vary depending on the combination of letters. Montgomery monogram shown. Letter sets for both styles are pictured in the additional views. Two to three weeks delivery for this item. 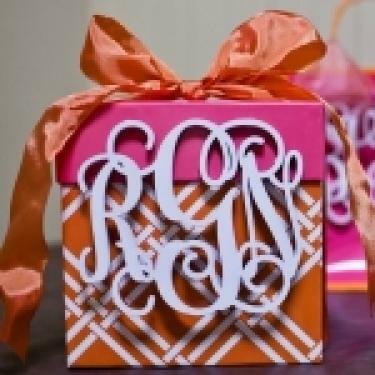 *Reminder - A monogram follows this order: first name initial or wife's first initial, last name (larger in center), middle/maiden name initial or husband's first initial. Click to view all monogram font styles for this item.